I Guess It Wasn’t Meant To Be . . . Tomorrow afternoon is Jan’s Pre-Op consultation preparing for her lithotripsy on Friday morning. She’ll be meeting with the anesthesiologist that will be taking care of her during her procedure. Hopefully after Friday she’ll be done with all of this. About 2pm I went outside to reinstall the new rear window awning. Turned out to be pretty easy except for a couple of missteps along the way. So I started with this. I first slid the awning fabric into the top frame and then slid the frame/awning into the window frame and locked it down. Next I slid the lower torque tube onto the bottom of the fabric. Starting with the left side which still had the spring installed, I fastened my locking pliers into the spring end and cranked it 16 times, the number of turns that it took to unwind the spring. Then I slid it on the awning arm and and locked it in place with the screw. Then it was on to the right side where I had had to drill out the rivets and remove that spring end so I could slid the fabric out. I put the spring in and was ready to to pop-rivet it in place when I remembered the pull strap. It has to be slid in the bottom groove on the torque tube opposite the fabric groove. Luckily I remembered it. Then after adding the strap and riveting the spring end in place, I locked the pliers into place and cranked in the 16 turns and then slid it on the awning arm. But when I when to remove the pliers I ran into a problem. Due to the way I had placed the pliers, I could not unlock and remove them. Apparently when I did the other end I had locked the pliers in place the other way around. So now I had to get the spring end back off the arm, and after using a screwdriver to stop it from unwinding, remove the pliers, turn them over, and then lock them back in place. Now I could rivet the spring end in place and I was done. Hopefully tomorrow or Thursday I’ll be able to take down big passenger side awning and take it over to Sundowner Canvas so they can make a new one. And while there I’ll pick up the rear awning for the other side. 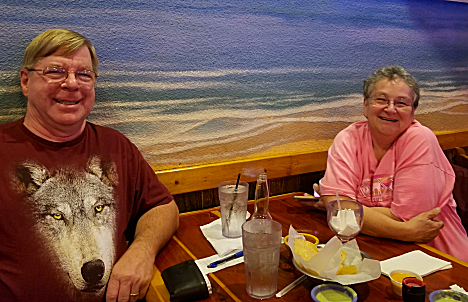 About 4:20 Jan and I headed over to Bacliff to meet up with Wil and Cyndy Olsen for dinner at La Brisa Mexican Restaurant, where we’ve met them before. We were once again hoping to get Wil and Cyndy together with our other friends Jan and Dale Thompson. But a family illness took its toll and they had to drop out. I guess it was not to be. Jan had the Perchuga Monterey with a Grilled Chicken Breast. I got a regular favorite for me, the Tortilla Soup. Wil and Cyndy hope to have their truck out of the shop later this week and then move up to the Katy area for the repairs on their 5th wheel. All this due to a wreck that they were involved in several months ago where two vehicles collided, and then hit them.